I love NetGalley for allowing me to read books ahead of time, but I have waited seven months to rave about Nova Ren Suma's The Walls Around Us. My best way to summarize my feelings for the novel is, "I loved it, everyone must read it, can someone please explain the ending?" 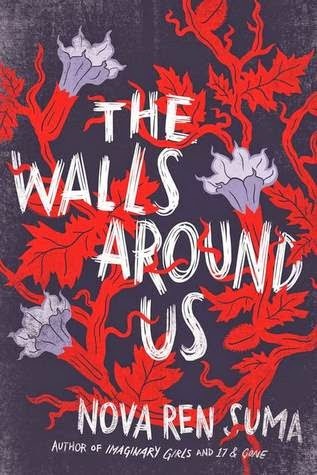 The Walls Around Us has two narrators: Amber, who is locked away in a juvenile detention center for the murder of her stepfather, and Violet, a ballerina whose best friend has been convicted of murder and sent to the same prison. Ori, the best friend and best person in the novel, never gets to share her inner thoughts, but the way she is described by Amber and Violet makes the reader feel sad and worried about her fate. When someone is locked up, time takes on an elastic quality, and the author plays with that, keeping the reader guessing when the events are taking place. Nothing in Suma's world is as straightforward as it seems, or as the characters wish. The Walls Around Us is a book about relationships, particularly between girls. After three years in the detention center, Amber has taken on a hive mind mentality--much of her thoughts are projected as part of the group. "We were, all of us, the exact opposite of special. We were bad. Broken. It was up to the state to rehabilitate us into something worthy, if it even could." Amber protects herself and disassociates from her actions by sticking to the pronoun 'we' when she refers to bad things that may or may not have been done. The end of the book was confusing to me, but only because Suma has drifted heavily into the magic realism by this point. I think once someone I know has read it and we are able to discuss, I will fully appreciate the conclusion the way that I loved the rest of the book.